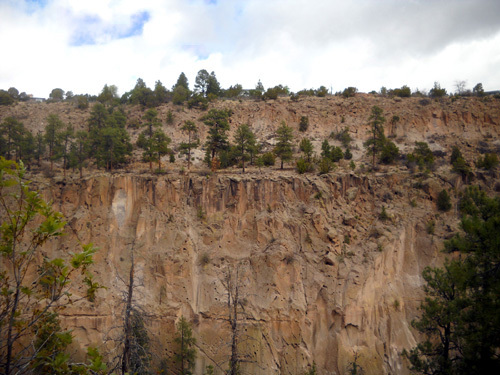 then clings to the north wall of North Mesa as it drops to the canyon bottom." I woke up with the intention of doing a two-hour hike in Bayo Canyon this morning but the clouds hanging over us this morning gave me some pause. 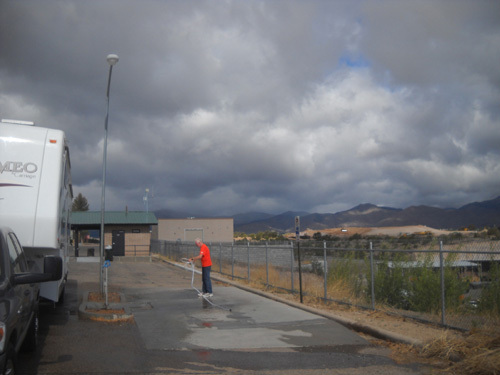 This was another interesting weather day in Los Alamos. 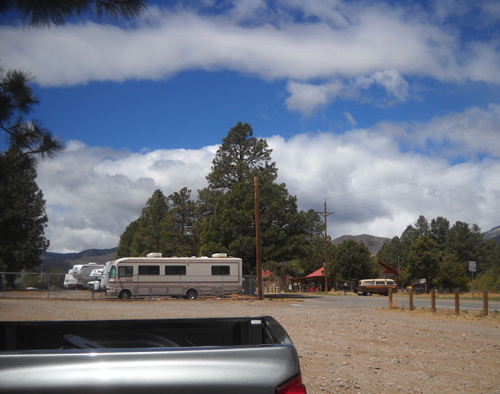 Wednesday it snowed in the nearby Jemez Mountains; we can still see the white peaks from our campsite. Yesterday it not only snowed in the mountains again, it also snowed in town! Luckily, the ground was too warm for it to stick in town. In a subsequent entry I'll show some dramatic photos from storms we've had during our ten-day stay in the area. Today was mostly cloudy with some glimpses of blue sky. Temperatures were in the low 40s to mid-50s F., which is unseasonably cool for this time of year. At least it didn't snow again. 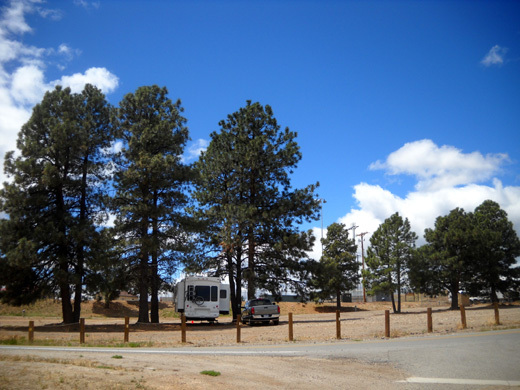 This morning we moved our camper seven miles across town to a large gravel parking area on North Mesa near the start/finish of the Jemez race. 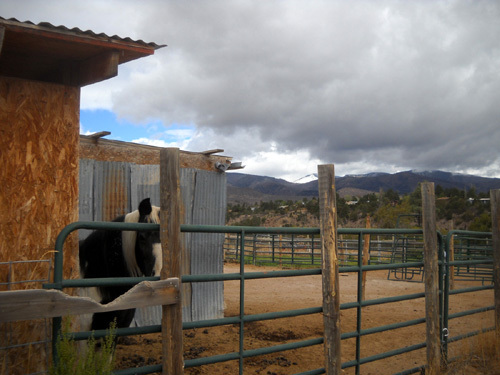 Note the menacing storm clouds over the Jemez Mountains to the west. We thought for sure we'd get dumped on, but there was no rain in town today. This is the third time we've taken the opportunity to use this race perk. 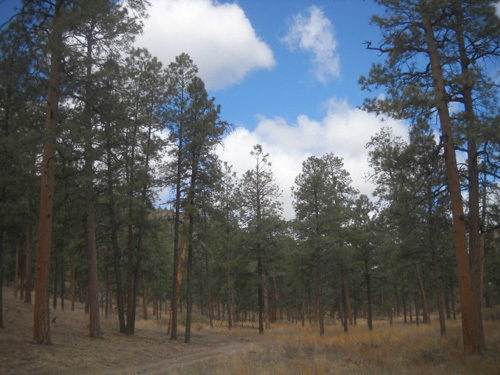 The lot is owned by either Los Alamos city or county and serves as a trailhead for one of the many multi-use trails in the local trail network. Although the parking area is only open for day use at other times (we've asked! ), runners and volunteers are allowed to park here on Friday and Saturday nights on race weekend. The Posse Shack is the red-roofed building behind the van. 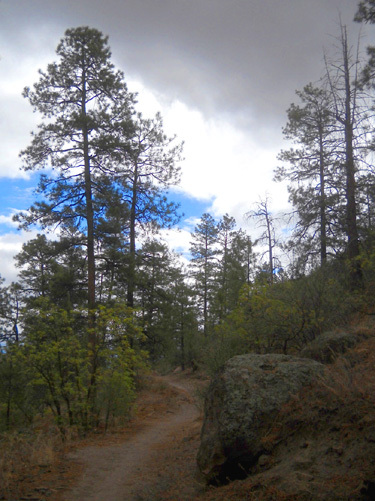 That's where the Jemez Mountain trail runs start and finish. Beyond that to the west are nice houses, a park, and an elementary school. To the north is Bayo Canyon. To the south are some ball fields and more residences. 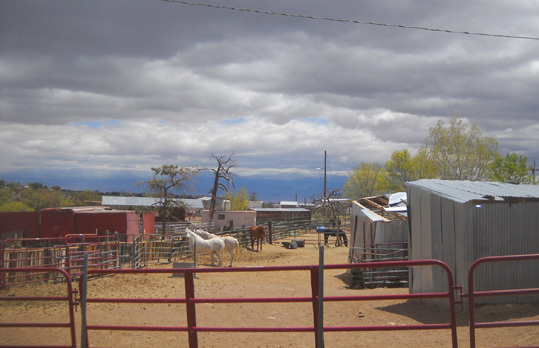 To the east are horse stables, a park, and Kwage Mesa. This is definitely a "mixed-use" neighborhood. We like this parking spot a lot more than the one on the other mesa where we stayed the first week. 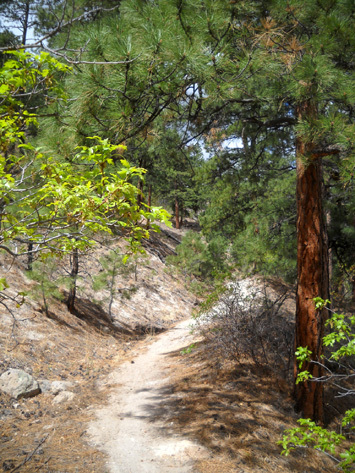 It's quiet, it's convenient to several trails, we have shade, and our phone and MiFi signals are better here. Too bad we can stay here for only two nights! Turns out, the trailer belongs to the ham radio guy who will work the start/finish of the race. Jim talked to him but didn't get his name. 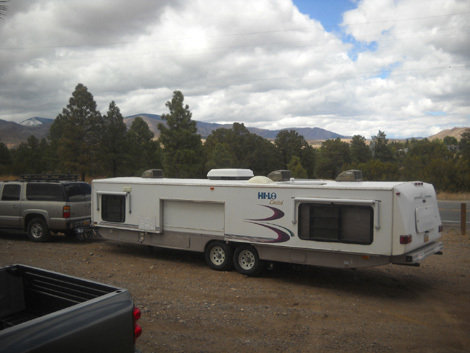 His Hi-Lo camper doesn't look as odd with the roof raised and the slides out. It has hydraulic levelers, which surprised us. 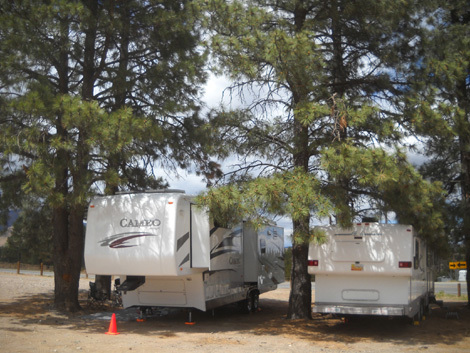 Those are common on motorhomes but not on fifth-wheels or travel trailers. We absolutely love our Big Foot hydraulic leveling system by Quadra. It's a big reason we purchased a 2010 Cameo and not a 2009 model. It's well worth the extra $$$ to us, as frequently as we move. The view beyond my computer monitor . 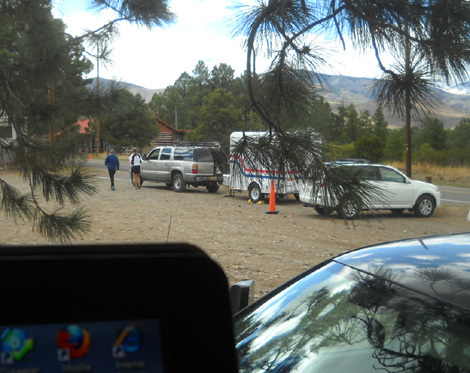 . .
Later in the afternoon the radio guy returned with a smaller trailer to use for race communications (above) and several runners arrived in their RVs, vans, and SUVs. About ten vehicles parked here overnight. When we got up the next morning at 5:30 the parking lot was full of 50-milers who'd arrived very early for the start of their race at 5. Most 50Kers and half marathoners must park farther away for their later start times. Horse poop from the nearby stables, but we really can't smell it from our camper! Fortunately, the wind usually blows it the other direction and not toward us. 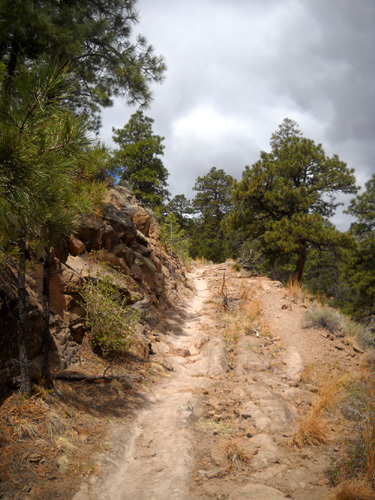 The Jemez 50-miler also uses one of the dirt roads that loop through the stables at the beginning of the race. I always enjoy walking or riding my bike through the stables. I grew up on a farm and love to see the animals. It's also cool to be on such rural property in the city, right next to a nice park and residential area. I assume folks rent the plots of land and put whatever buildings up that suit them. Although the barns and sheds are fairly old and utilitarian, most of the fenced plots are neat and orderly. Some display interesting signs, flags, or other personal touches. Most of the plots have horses. Some have goats, chickens, and other farm animals. Dogs often visit when their owners come to tend the livestock. All the sounds and smells nearly overwhelm Cody-Lab's keen senses as we pass by the mini farms! He wants to examine everything along the way. 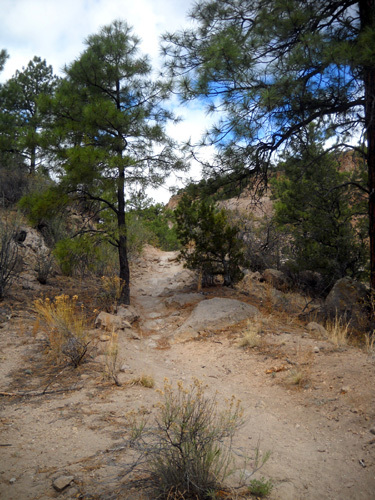 There are two trailheads near our parking spot that go down into the Bayo Canyon. 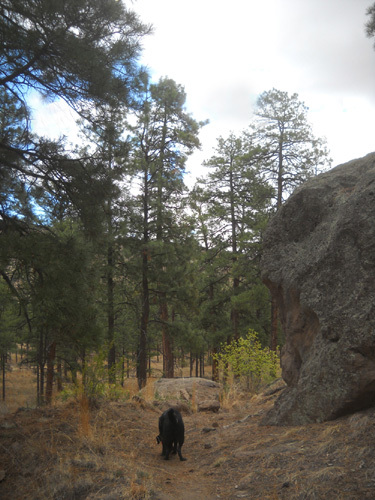 One is directly behind us, close to the fence in the picture above; that's where all of the Jemez runners will come back to the Posse Shack at the end of their races. The other trailhead is about half a mile to the east and through the stables; that's the route the 50-milers will take tomorrow morning at the beginning of their race. 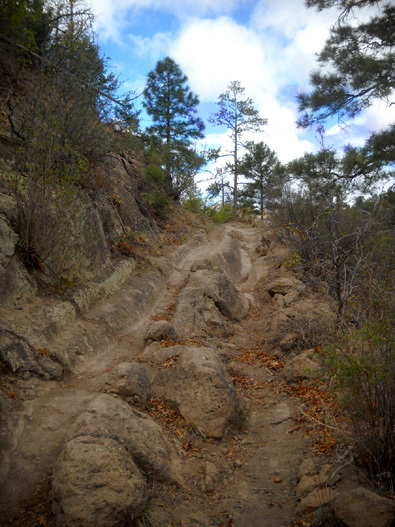 Both of these spur trails from the mesa top access the Bayo Canyon Trail and the entire Los Alamos trail network. The half-marathoners and 50K runners start on North Mesa Road and go west to reach a third trailhead into the canyon. I have run/hiked a 5-6 mile loop above and through the Bayo Canyon at least two times before. 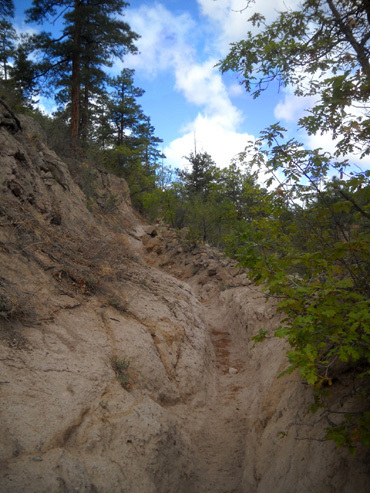 It's a scenic, fairly easy hike on sometimes-rocky terrain down into the canyon in either the clockwise or counter-clockwise direction, up the other side to the "bench" below Barranca Mesa that I wrote about a few days ago, down into the canyon again, and back up to the camper. 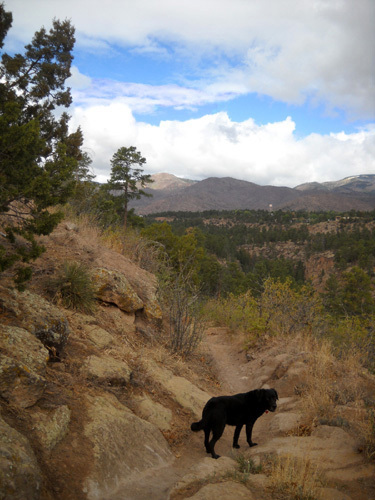 After we got settled into our camping spot this morning Cody and I took off through the stables for half a mile to the more easterly trailhead into the canyon. 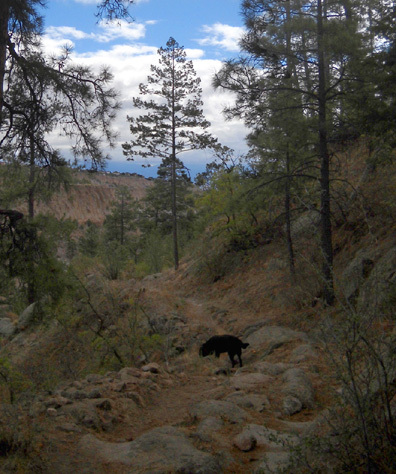 Another thing to note in that photo is the flat-looking trail across the canyon. 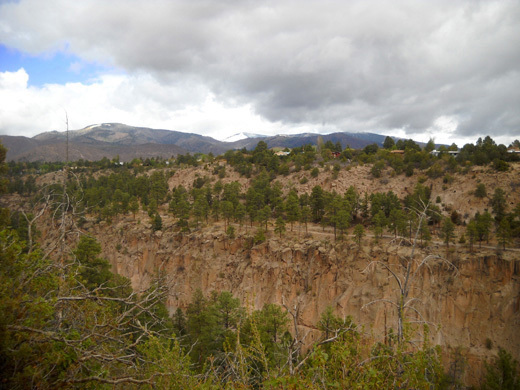 That's the Bayo Bench Trail where Cody and I will be hiking in a little while as we loop around the canyon. 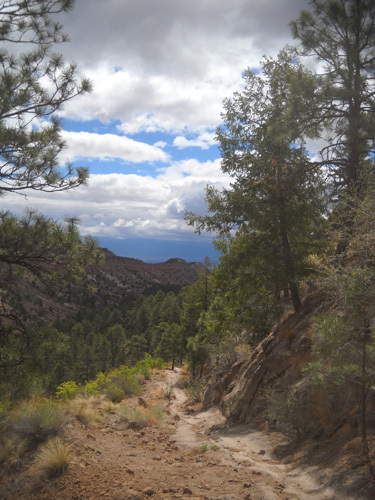 Trail users on the bench trail can also look across the canyon and see much of the trail Cody and I are currently on. At the trail intersection down in the canyon a quarter mile later, the Jemez runners go left (west) on the Bayo Canyon Trail; Cody and I went right (east). In a few minutes we'll be on top of that spit of land, looking down here. I don't see a name for this trail on my detailed maps. 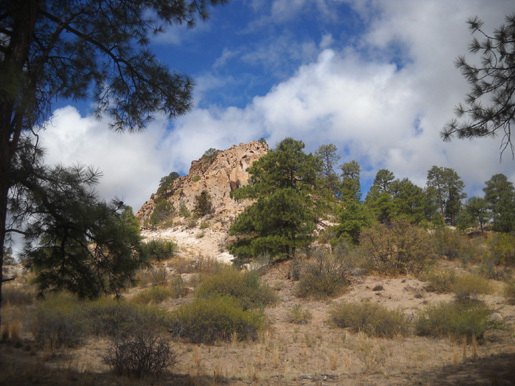 It climbs about 200 feet in elevation to access two parts of Barranco Mesa.